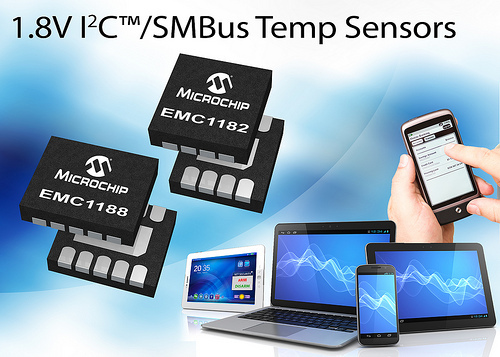 Microchip Technology Inc. has announced a new six-member family of temperature sensor ICs called the EMC118X. This is the world’s first family of temp sensors with 1.8V SMBus and I2C™ communications, which is required for interfacing to the latest generation of smartphone, tablet and PC chipsets. Additionally, this integrated low-voltage I/O support reduces cost and board space because it is accomplished without an external voltage level shifter. These are also the first temp sensors to use an advanced sample-frequency-hopping filter, which enables temperature-monitoring traces of up to 8 inches in noisy environments with accurate readings. The EMC118X family serves a broad range of applications in the mobile, commercial and embedded computing markets, by combining the above features with options for dual, triple and quad temperature monitoring, along with hardwired system-shutdown settings that can’t be overridden by software.